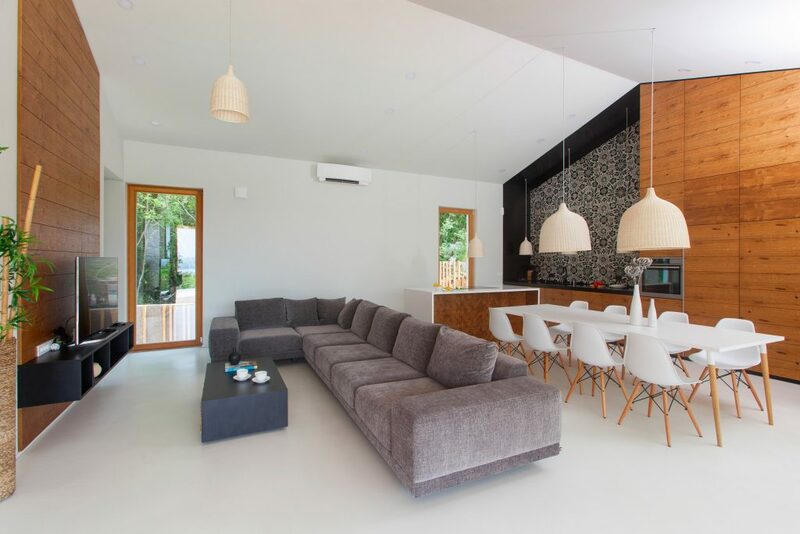 Home / Ideal News / Seamless concrete floors: why choosing them? Seamless concrete floors: why choosing them? Another advantage of this kind of floor is that, thanks to the absence of joints, it is easy and quick to clean. Amongst modern seamless floorings, Ideal Work’s micro-cement floor Microtopping® stands out for its concrete effect and for its typical “tactility” and neutrality. Microtopping® is often chosen to coat the surfaces of museums and showrooms because it highlights the exhibited objects and artwork. In a house, the decorative microcement is able to match to the most varied styles and to give them value: given its minimal look, it perfectly matches an essential style, but it goes also with vintage, ancient or baroque styles. It is greatly customizable in colours and shades, and it’s very wear resistant. Moreover, it is perfect for an internal renovation because it allows to create a seamless surface without demolishing the existing floor and therefore reduces both the installation time and the price. When choosing a floor, one often doesn’t consider joints: made of a porous material, they start to blacken right after the installation because they absorb liquids, dirt, stains etc. Cleaning the floor’s joints is not easy, it takes time and constancy, since the problem keeps coming back. Seamless floors, in particular concrete seamless floors like the microcement Microtopping®, are very easy to clean instead; the absence of joints makes it hard for bacteria and dirt to accumulate and be absorbed. All it takes to clean floors in microcement is a wet cloth and a bit of neutral PH detergent. With concrete seamless floors spaces seem larger: the absence of joints makes the environment appear more fluid, instead of caging it in a grid. They are perfect for big rooms, but able to embellish and give value to small spaces too. A small bathroom, for example, if renovated with a seamless floor will seem larger and more modern. 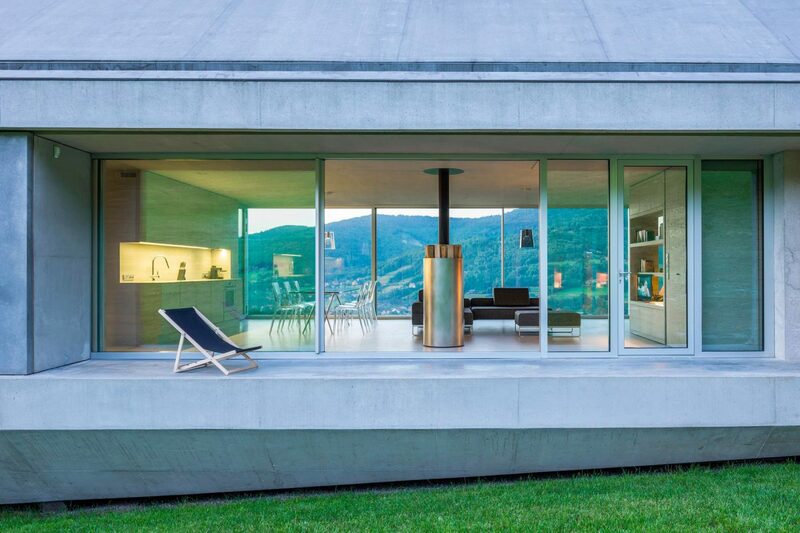 It is therefore possible to choose only one floor to use both indoor and outdoor, creating a modern and unique effect of continuity. This way, the living room will have the same look as the terrace, the porch of elsewhere. must be quickly removed from the surface before they penetrate deeper. In addition to the esthetic and technical features we’ve already seen, seamless floors maintain their colour unaltered over time, even when installed outdoor, because the protective treatments protect them from UV rays. 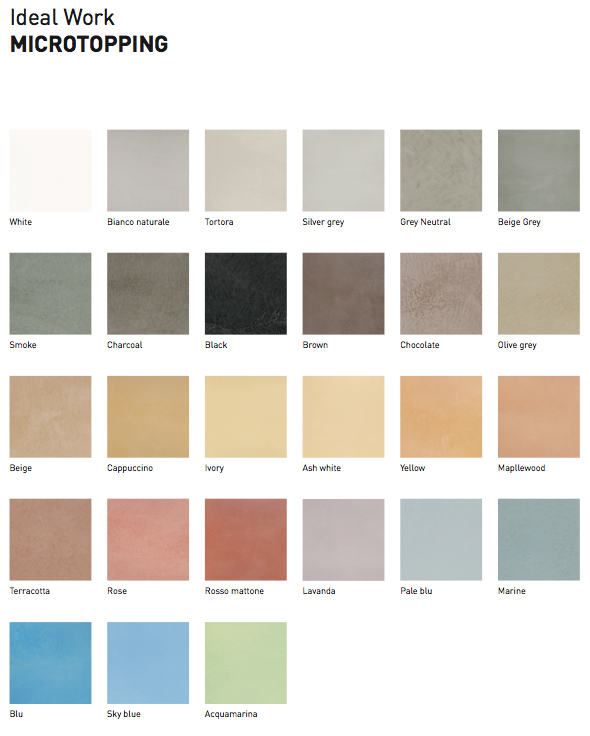 Ideal Work®’s seamless concrete floors are highly customizable in colours, shades, textures and effects: from the concrete effect to the wood effect, from microcement white to Smoke, through Brick Red and Cappuccino. There are lots of available colours and variations. Since seamless floors are an artisanal solution, there is always the possibility to ask Ideal Work’s experts for advice; they will create a custom-made solution to satisfy your needs and requires. Discover more of Wall Texture Microtopping! The handcrafted installation allows to decide the colour and the final effect right up until the very last moment, which would be impossible with other kinds of floors such as slabs and tiles. 4 – Clean the surface. 14 – After a few days it is very advisable to apply a protective resin. The kind of resin will depend on the traffic and the place of application. Among the various resins, we recommend Ideal Seal, Ideal PU WB, Ideal Pu78. Among Ideal Work®’s seamless coatings Microtopping® stands out for its versatility, which makes it suitable to all surfaces. For a modern house in Piazzola sul Brenta it has therefore been chosen to cover a wellness area from the bathroom, to the walk-in closet, to the front door. It gives the spaces minimalism and linearity. With Ideal Work®’s seamless floor Microtopping® it’s possible to create large surfaces in a short time, like the Benetton Store in Vienna: a 1200 sq space, totally coated with Ideal Work’s microcement flatwork.